For those who knew Cardinal Jorge Bergoglio prior to his election to the pontificate, this is nothing new. 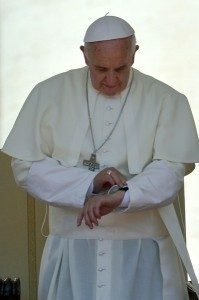 I spoke to a few priests from Buenos Aires who worked with Cardinal Bergoglio in different capacities and from them learned that confusion is emblematic of his ministry. One anecdote in particular was very instructive. I was told that people from opposite camps would both come out of meetings with Cardinal Bergoglio believing he supported their position. “He’s with us but can’t say so publicly,” they would relate, as would those who met with him from the opposing camp. While in an archdiocese this may work for a time, this learned priest told me, in the Vatican where just about everything the Pope says is trumpeted to the world, these kinds of discrepancies become evident more quickly. Francis, the priest told me, is very much a Peronist — named for former Argentina President Juan Domingo Perón. Like Perón, Pope Francis plays with both left wing and right wing factions. The priest tells a story about President Peron that helps to understand Francis. Once Peron was in his car and at a fork in the road his driver asked him which way he would like to go, to which Peron replied: “Put the flicker on for a right turn, but go left.” One last note about Bergoglio, related by the priest, is that when pushed, he will go left out of a great apprehension of being labeled a right-winger by the media. Go here to read the rest. The last observation brings to mind this comment by Charles Peguy: No one will ever know how many acts of cowardice have been committed out of the fear of seeming insufficiently progressive. It seems that Pope Francis is everything to everybody and nobody. This kind of dissimulation is otherwise known as lying. Famous example: the devil.